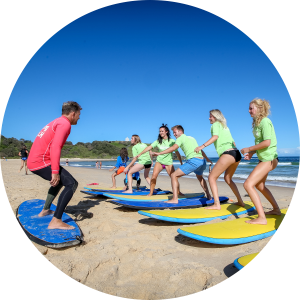 Soul Surfing Surf School is a family owned and operated business in Port Macquarie. Well actually its more a passion and a way of life! Owners Corey and Loren Enfield live and breathe surfing, yoga and the healthy lifestyle that these bring. Together with their four kids ranging in ages from 9 to 17 years, this salty mob would love to share their experience with you. In more than a decade of operating a surf school, Corey and Loren with their talented team of instructors, have enabled thousands of people of all ages to surf. With more than 80 years of combined surfing experience, Soul Surfing is a great choice to learn how to surf in a fun and safe environment. Available 7 days a week, on one of Port Macquarie's local beaches. We make surfing easy, fun and unforgettable. Years of experience have helped us design teaching methods that adapt to your needs and work quickly. Soul Surfing is dedicated to helping every student get that perfect wave. 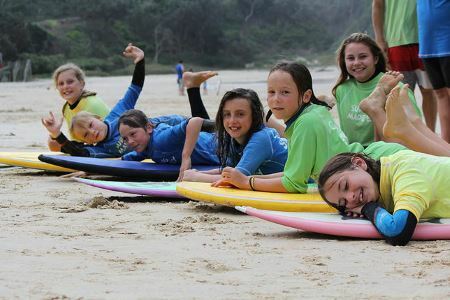 This program develops our young local children into strong and knowledgeable surf wise groms. 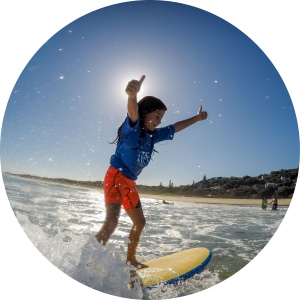 If you want your kids to develop their surf skills and be capable of going to the beach alone by the age of about 13yrs then this program is for you. Surf lessons designed for women by women. This fun, nurturing environment will allow you to be care free (for a short while at least) and give you the time to be yourself while doing something great for the body, mind and soul. Every morning we are out on the beaches checking the surf conditions so you will get the best possible waves for your lesson. We are the only surf school that is fully mobile to take advantage of the most ideal conditions to ensuring ultimate lesson quality. Our coaches have been selected because of their communication skills, surfing experience and beach/surf awareness. Small class sizes will give you the support, feedback and encouragement you need to achieve your goals. Specific coaches will be assigned to you or your group depending on your needs. A broad range of services that can be customised to your needs ensures we deliver a memorable, safe, and fun surfing experience for you, your family, or your business. More than 80 years of combined surfing and 25+ years of teaching experience there is no better surf school to learn and experience the joy of standing up and catching that first wave. This could be you and your friends learning how to surf and having a heap of fun! 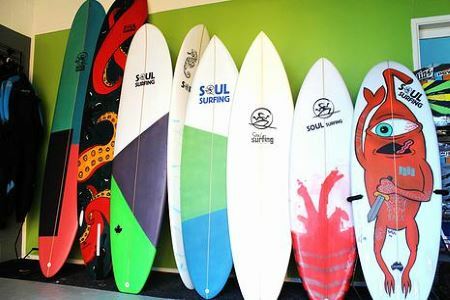 My partner and I tried both Surf Schools in Port Macquarie during a recent holiday, and of the two, we both agree that Soul Surfing is definitely the best. In fact, it wasn't until we went to Soul Surfing that we realised just how short-changed we were at the competition - where the instruction amounted to little more than "here's a board, here's how you stand up, now get out in the water and practice". At Soul Surfing, the instruction came after every wave - "less of this, more of that, bend your knees, look up more, more weight on your front foot etc etc etc". And what do you know - at the end of the lesson we were surfing and LOVING it. Highly recommended." 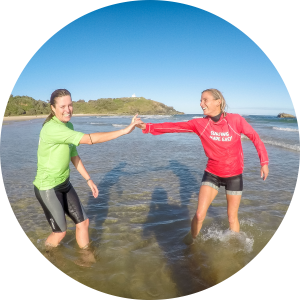 "My partner and I tried both Surf Schools in Port Macquarie during a recent holiday, and of the two, we both agree that Soul Surfing is definitely the best. In fact, it wasn't until we went to Soul Surfing that we realised just how short-changed we were at the competition - where the instruction amounted to little more than "here's a board, here's how you stand up, now get out in the water and practice". At Soul Surfing, the instruction came after every wave - "less of this, more of that, bend your knees, look up more, more weight on your front foot etc etc etc". And what do you know - at the end of the lesson we were surfing and LOVING it. Highly recommended." 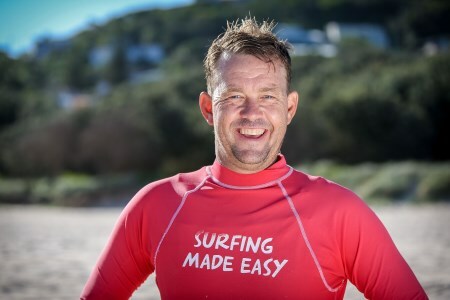 I have been head coach from the moment we took on the surf school business. The first two years I spent months on developing the best techniques to use for the beginner students. To this day these techniques remain in use and have proven to be the easiest, fastest, and most effective techniques to progress surfing skills. An understanding of human behaviour as well as spotting strengths and weaknesses in an individual remains one of my greatest abilities. Being able to communicate and share with students the knowledge required to improve is a skill few possess. YOU and your best foot forward into life is my PASSION! I aim to help children, adolescents (those breezing through these years as well as those struggling), mothers, adults and holiday makers make memories that are fond when remembered. Making surf lessons valuable, educational, challenging and life reflecting all while having a blast learning the thrills, spills and skills of trying to learn to surf! Whether this be in 1 surf lesson, a series of surf lessons or at a specialised health and wellbeing surfing lifestyle event or program. Helping you reach your goals is my passion! 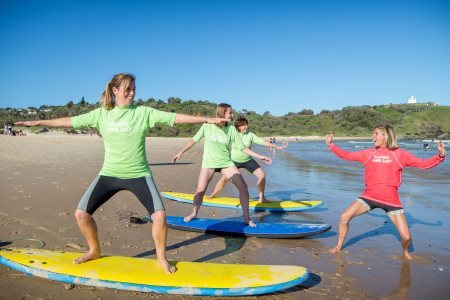 Port Macquarie’s Innovative Surf School is a family run business operated by Corey and Loren Enfield. Together we have surfed for a combined 50+ years and have always surfed for the pure love, joy, and fun it brings to us. Developing a business around our passion is our pleasure. All of our four children love to surf too. We continue to develop new and interesting surf programs built from our experiences so we can lead through innovation. Being able to help someone fall in love with the joy of surfing is the most satisfying reward. Just ask any number of our students why they love to surf with us and it becomes clear why we love what we do and also why we are good at it. The progression into building surfboards was a natural process (albeit challenging), as we could see that the right surfboard is the most important factor to really enjoy surfing. If you really want to learn about what sort of board is right for you then make time to talk to Corey and we guarantee it will be enlightening and rewarding. We are located in Port Macquarie on the mid-north coast of NSW Australia. It's the perfect place to both live and holiday. So whether you're a local or just visiting please come and say hello and we'd be more than happy to help you out whether you're a first timer wanting to learn or a skilled rider looking for the best local knowledge.